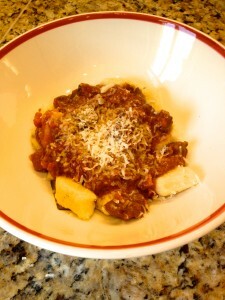 Tender little potato dumplings are covered in a rich meaty bolognese! 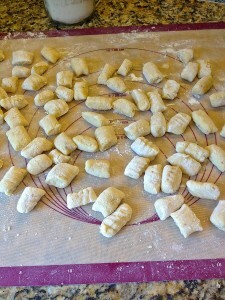 I’ve been working on my gnocchi recipe for years, and each time they get better. With just three ingredients, this recipe is more about technique than ingredient driven. Give this recipe a try. 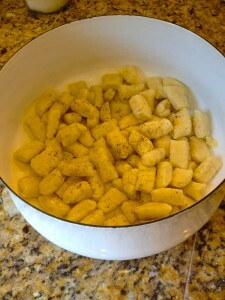 The key to fluffy light gnocchi is using the right potatoes and cooking them to be dry, so the gnocchi stay light. I’ve found that baking russet potatoes give the best filling for the gnocchi dough. Allowing them to cool before mixing it with flour and egg keeps them from becoming sticky and heavy. Preheat the oven to 450 degrees. Scrub three large russet potatoes, and prick holes in them. Don’t wrap them in foil, just place them directly in the oven on the racks. Bake for about 1 hour to 1 hours 15 minutes. Once the skins are dry on the outside and the potato meat is soft, scoop out the flesh and place it in a food mill or potato ricer which is placed over a large bowl. Pass the potato through the food mill. 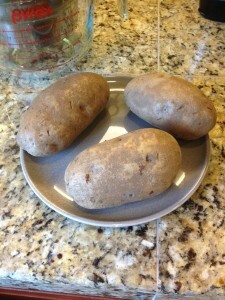 Spread the potato over a cookie sheet and season with salt and pepper and allow it to cool completely. 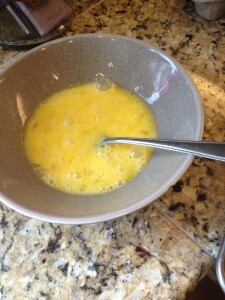 Then lightly mix 1 egg plus 2 tbs. extra egg. 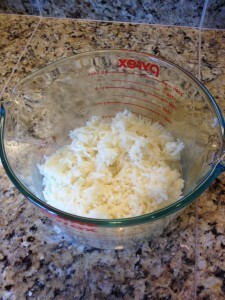 Place the potato onto a silpat or directly on a counter and incorporate the egg. 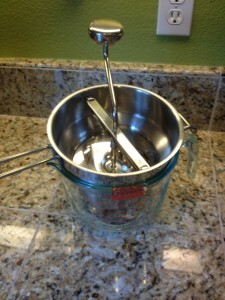 Then add 1 and 1/4 cup all purpose flour. Mix just until it forms a ball. You don’t want to overwork the dough or it will become too stretchy. Then cover the dough with plastic wrap and let it rest for 30 minutes. Don’t skip this step. 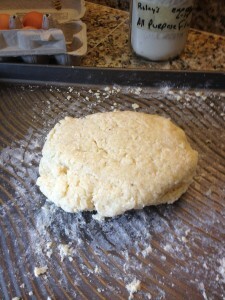 Once the dough has rested for 30 minutes, sprinkle a bit of flour on your silpat and divide the dough into about 8 even pieces. Then roll the dough into long 1 inch thick logs. 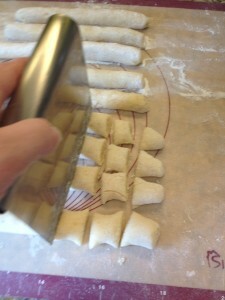 Once you have all the gnocchi dough rolled out, use a bench scraper to cut 2 inch pieces from the gnocchi logs. After all the gnocchi have been cut, use a gnocchi board (I couldn’t find mine), or use the back of a fork and gently roll the gnocchi over the tines to create small ridges in the dumplings. The ridges help hold the sauce on the dumplings. Continue until all the gnocchi are finished. Bring a large pot of salted water to a boil and turn the water down to a medium high simmer. And begin adding gnocchi, a few at a time. 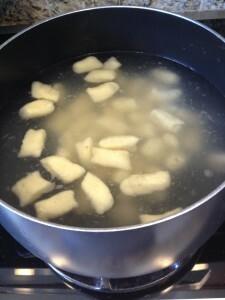 The gnocchi will begin to float so once they do, continue to cook for another minute. Once they are all floating, drain the gnocchi and season with a bit more salt and pepper, and serve with bolognese. If they aren’t being used right away, toss with a few tablespoons grape seed oil, to keep them from sticking. 1 Egg plus 2 tbs. Prick the potatoes with a fork. Place the potatoes in the oven and bake for 1 hour to 1 hour and 15 minutes. 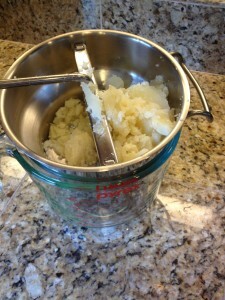 Scoop out the potato flesh, and pass it through a food mill or potato ricer set over a bowl. 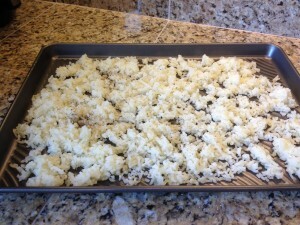 Spread the potato flesh over a large baking sheet and season with salt and pepper. Allow the potato to cool completely. Lightly beat 1 whole egg and 2 tablespoons extra egg. Flour a silpat or on the counter, and add the potato and beaten egg. 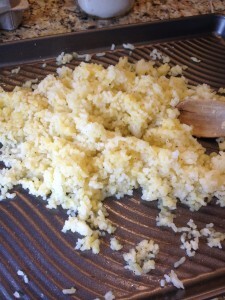 Incorporate the potato and egg and add the flour. Mix with your hands just until the dough forms a ball. Wrap the dough in plastic wrap and let rest for 30 minutes. Sprinkle your work surface with a bit of flour, and portion the dough into 8 sections. Roll each section until you make a long 1 inch thick log. Continue until you have 8 gnocchi logs. 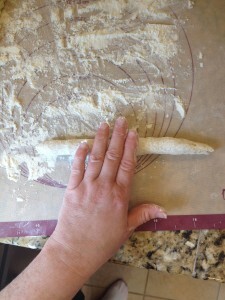 Using a bench scraper or long knife, cut the dough logs into 2 inch pieces. 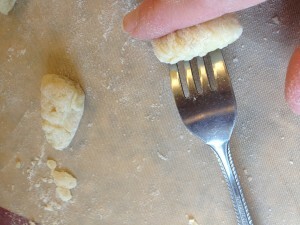 With a gnocchi board, or the back of a fork, roll the gnocchi across it to create small ridges in the gnocchi (the ridges help the sauce stick to the gnocchi). Turn down the heat to a medium-high simmer and begin adding gnocchi, a few at a time. 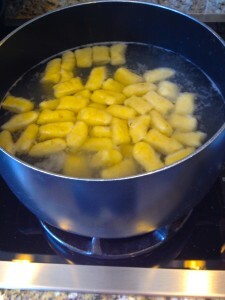 The gnocchi will begin to float as they cook. Once all the gnocchi are floating, drain them. Re-season with salt and pepper, and serve with sauce. *If you won't be serving your gnocchi right away, drain the gnocchi and add a few tablespoons grape seed oil and toss the gnocchi so they don't stick together.